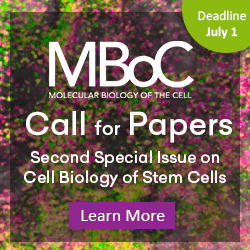 Nicholas R. Davenport of the Program in Cellular and Molecular Biology, University of Wisconsin, Madison, was named by the Molecular Biology of the Cell (MBoC) Editorial Board as recipient of the 26th annual MBoC Paper of the Year Award. As a graduate student in Bill Bement’s lab, Davenport was first author of the article “Membrane dynamics during cellular wound repair” (Mol. Biol. Cell 27, 2272–2285). Davenport will present his research at a Minisymposium at the ASCB|EMBO Meeting in Philadelphia this December.